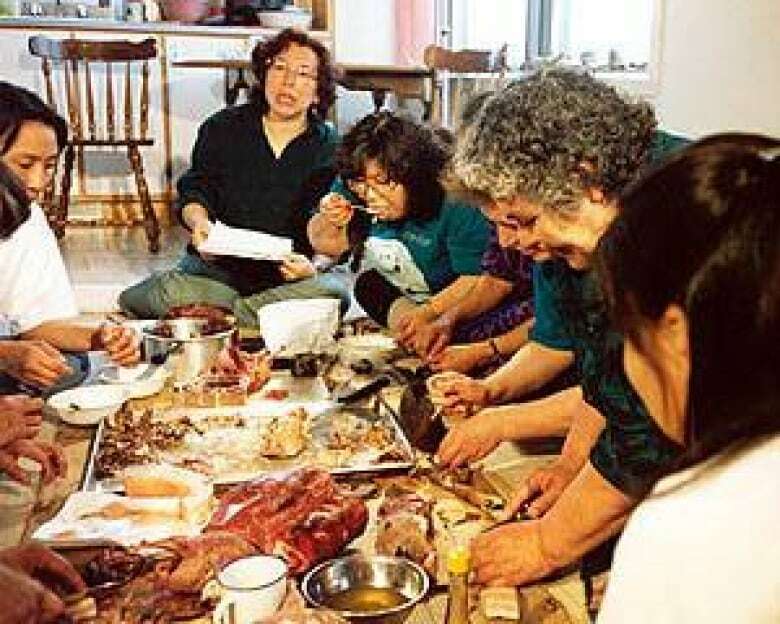 Traditional or country foods such as Arctic char and beluga whale skin are an important source of nutrition and an integral part of the culture among Inuit in Canada's north. That's why Canadian scientists are trying to trace the path of toxic mercury that increasingly contaminates these foods as the Arctic grows warmer. How does a warming climate boost toxic metals in Arctic foods? Traditional or country foods like Arctic char, shown here hanging out to dry near Rankin Inlet, are considered far healthier than processed alternatives available in the north, despite concerns over toxins. 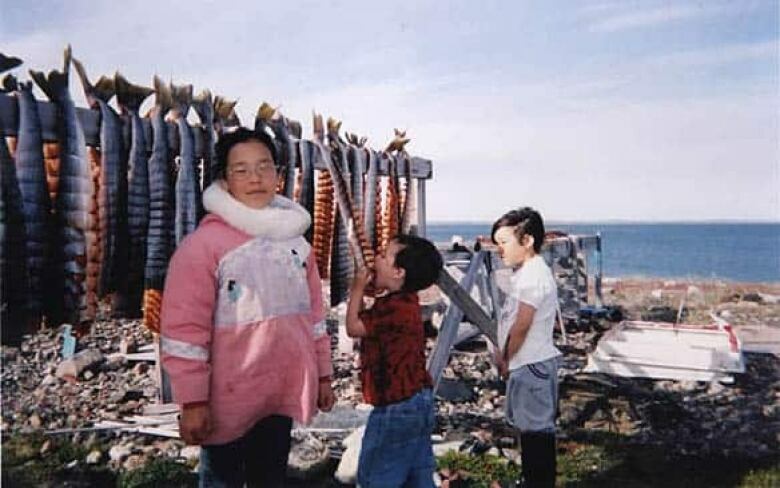 ((Eric Loring/ITK))In spring, Inuit families head to the shore together and pull feisty fish from the seemingly pristine waters of the wild Arctic. While northern lakes look clean and are hundreds or thousands of kilometres from polluted cities in the south, however, some hide rising levels of toxic mercury. Concentrations of methyl mercury, the most poisonous form of the metal, are now so high in freshwater fish and marine mammals in some parts of the Arctic that they could not be sold legally in Canada, Environment Canada reports. The increased levels seem linked to warming temperatures in the north, but the nature of the connection is still largely a mystery. A network of scientists ranging from biologists to atmospheric scientists to glaciologists is working hard to track the path of mercury as it makes its way from industrial areas across the northern hemisphere into the Arctic food web. They are making some intriguing discoveries. Toxins like mercury and PCBs (polychlorinated biphenyls) can travel long distances across the northern hemisphere on air currents. From time to time, they fall to the ground with rain or snow, but revaporize into the atmosphere when the ground heats up. In that way, they hop from place to place, said Eric Loring, senior researcher for the health and environment department for Inuit Tapiriit Kanatami. Once they get into the Arctic, however, they don't revaporize, Loring said. "And they start building up in the environment." As toxins move higher up in the food chain, from invertebrates to fish to marine mammals, they become more concentrated. That's a big human health concern in the Arctic, where people top the food chain, eating large predators such as seals and whales. In the 1980s, when Inuit communities first heard about organic toxins like PCBs and DDT in their food, they began to fear some of their healthiest practices. "People stopped eating their country foods; people stopped breastfeeding," said Loring, who has lived most of his adult life in remote northern villages and camps. "People stopped hunting, because they were scared of potentially harming their children." Northerners such as Elena Labranche, 44, who lives in Kuujjuaq, Que., a remote community of 3,000, are keeping a close eye on the data. Labranche, who is Inuit, goes fishing or hunting nearly every weekend with her husband and sometimes her six-year-old grandson. Their catch of traditional or country foods changes with the seasons. "Geese are coming soon … ptarmigan," said Labranche. "Summer, it's going to be seals and belugas." Labranche is the assistant director of public health for Nunavik, the northernmost region of Quebec, and area of tundra surrounded by Hudson Bay and Hudson Strait. Her work includes promoting country foods as far healthier than store-bought, processed alternatives. Her favourite is muktuk — beluga skin. Catch limits make it a rare delicacy that is enjoyed only about twice a year, but it remains an integral part of the cultural life in Nunavik. "When people do catch it, it's shared by the community," she said. "This is a special occasion. Usually, we go to the elders' house and do a big feast." As a public health official, Labranche is aware of concerns about the toxins mixed in with the nutrients and vitamins. Levels of some have been declining, but not all. "For mercury, we know that it's still going up," Labranche said. But there's a lot that's still unknown, including just how the mercury is getting into the Arctic food chain, whether it will keep rising, and what could mean for the Inuit way of life. People in Kuujjuaq in northern Quebec enjoy a meal of seal, whale, caribou and char. ((Eric Loring/ITK) )Two decades ago, scientists believed that the clean Arctic environment made Inuit an ideal comparison group for studies on people in more polluted environments. Unexpectedly, researchers discovered levels of toxins such as PCBs (polychlorinated biphenyls) were far higher in Inuit breast milk than those of mothers in the south, said Eric Loring, senior researcher with the health and environment department of Ottawa-based Inuit Tapiriit Kanatami, the national organization representing Inuit. That led to the launch of research and monitoring programs and mobilized Inuit leaders who took the data to the international community. Many chemicals such as PCBs and DDT were banned, and levels have been decreasing in the Arctic environment and in animals. "Then along comes mercury," said Loring. Mercury can cause developmental problems in children and nerve and brain symptoms ranging from tremors to memory loss in adults. It is a trickier substance than PCBs and DDT for a number of reasons, Loring said. Even though large amounts are released into the air by human activities such as coal burning, smelting, mining and waste incineration, mercury also occurs naturally in the environment, where it undergoes a complex chemical cycle. Secondly, climate change seems to be releasing huge existing stores of mercury from the environment, and curtailing mercury production may not be enough, Loring added. "Some of this stuff we can't actually control." Evidence is mounting that a lot of the mercury carried by winds into the Canadian Arctic comes from rapidly industrializing Asian countries such as China and India. 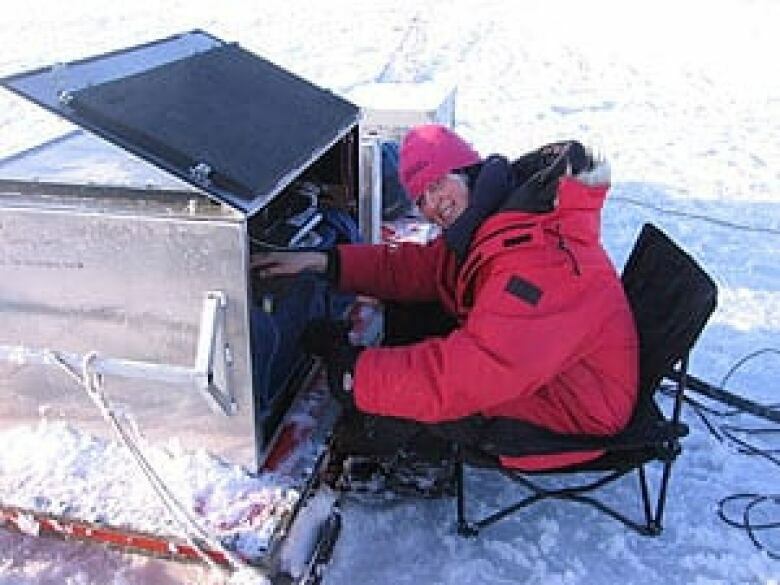 Alexandra (Sandy) Steffen, shown here downloading data during field work in Barrow Alaska in 2009, said an estimated 50 to 200 tonnes of mercury get deposited in the northern polar region each year. ((Courtesy of Sandy Steffen))Alexandra (Sandy) Steffen, 40, an atmospheric mercury specialist at Environment Canada, has been monitoring mercury levels from a station in Alert, Nunavut, since 1995. She said mercury can vaporize and travel long distances in the air. An estimated 50 to 200 tonnes get deposited in the northern polar region each year. A model created by one of Steffen's collaborators, Dorothy Dunford, points to Asia as the major source. Recently, Steffen's research has revealed some good news - levels of airborne mercury measured in Alert decreased between 1995 and 2007, possibly due to lower emissions from North America and Europe over that period. Every spring in the high Arctic, stable mercury in the air gets converted to a more reactive form that drops out of the atmosphere. It lands on surfaces such as snow or ice, or attaches to soot or dust in the air. From there, it somehow makes its way into the food chain. Steffen's research group has found the conversion to reactive mercury, which is unique to polar regions, is very sensitive to temperature. According to the Intergovernmental Panel on Climate Change, average Arctic temperatures increased at almost twice the global average rate over the past 100 years. As they rise, the polar conversion between stable and reactive mercury has been moving earlier in the season from May to April. "If it starts warming up, there will be changes in how much mercury's deposited," she said. "What the change is, we're not entirely sure." Glaciologist Christian Zdanowicz, 44, has a strategy that he hopes will help predict such changes. 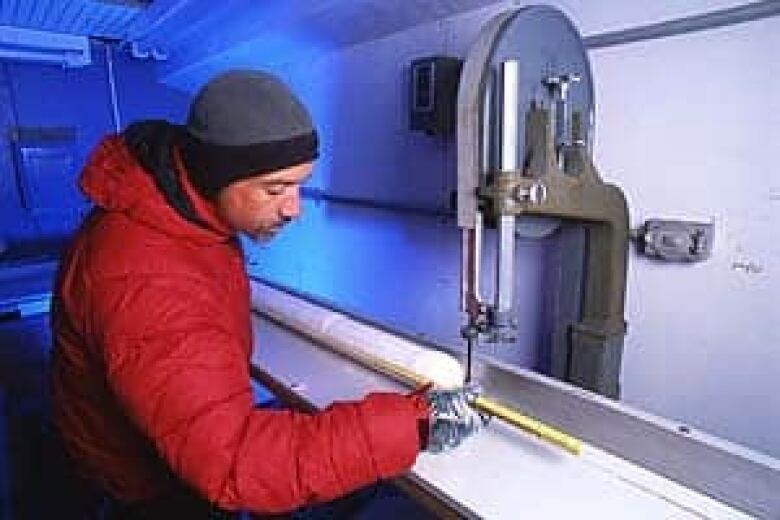 Christian Zdanowicz, seen here measuring an ice core inside the cold room laboratory at Natural Resources Canada in Ottawa, hopes to analyze ice deposited 8,000 years ago to find out how a warmer climate affected mercury content. ((David Barbour/Courtesy of Natural Resources Canada) )"In the Arctic, if you change climate, you change the reactivity of the Arctic atmosphere," said Zdanowicz, who works for Natural Resources Canada. "Mercury cycling is very sensitive to temperature change, snow and ice cover change, sea ice cover change. So if we really want to anticipate how is this going to change in the future, one way to look at it is to look in the past." Atmospheric measurements go back just 15 years, but decades or even centuries of records are buried in Arctic glaciers. Each year, the glaciers gain a new layer of snow, embedded with particles from the air, including mercury. Zdanowicz drills through glaciers all over the Arctic and collects cylinders of ice containing a stack of layers. "It's a bit like using tree rings," he said. "You're drilling through time." He cuts the cylinder into segments, each representing a time period, with the oldest at the bottom. The samples are sealed in bottles and carefully analyzed for mercury at his Ottawa lab, which is equipped with a specially designed cold room with ultra-pure air. In this way, he hopes to see changes over time and gain some insight into the role of the changing climate. In fact, Natural Resources Canada has a collection of ice cores that contain layers deposited up to 8,000 years ago — a time when the earth was far warmer than today. Zdanowicz also hopes to analyze their mercury content as a comparison. Still, he isn't sure he'll be able to complete his studies. He learned in March that funding the environmental geosciences program that his mercury work falls under will be cut short in a year instead of wrapping up four years from now. "Whether we will be able to continue that work is highly uncertain at this time." The path taken by mercury into the food chain from the air, snow, ice or ocean currents isn't yet clear. 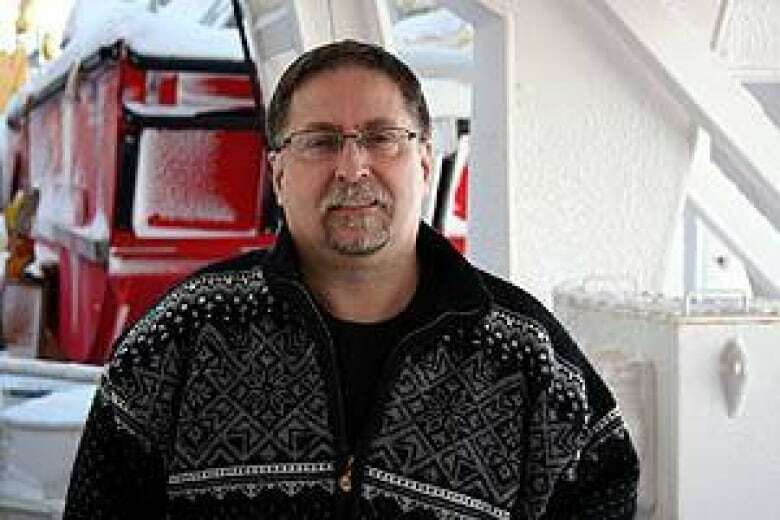 Gary Stern, shown here on a 2008 research cruise in the Arctic, has found that the growth of algae seems to boosts the amount of mercury in the food chain. ((Emily Chung/CBC))Gary Stern, a senior research scientist with the Department of Fisheries and Oceans and professor at the University of Manitoba, is seeking answers by studying burbot fish in the Mackenzie Basin. Levels of mercury in the fish roughly doubled between the mid-1990s and 2008. Surprisingly, toxins such as PCBs and DDT have increased three- to four-fold, even though their levels in the atmosphere have decreased. To figure out why, Stern examined layers of sediment accumulated over time. He found that increased mercury was linked to an increased amount of a special type of carbon associated with algae. It appears mercury dissolved in the water sticks to the algae, which multiplies when temperatures are warmer and summers longer. "It actually scavenges mercury and PCBs from the surface waters," Stern said. The mercury-laced algae are eaten by zooplankton and invertebrates. In that way, toxins dissolved in the water, possibly for decades, begin their journey up the food chain toward humans. Another effect of climate change is the degradation of permafrost. Environment Canada researcher Derek Muir is studying how that changes the release of mercury from the soil into streams and lakes. Not only freshwater is affected. Stern estimates there is now 100 times more mercury dissolved in the Arctic Ocean now than there is in the bodies of living organisms. That suggests that even if humans stop spewing mercury into the air, it could be a while before levels in fish and animals start to decline. Labranche has been keeping on top of the latest information about mercury contamination in country foods. "What is most contaminated from what we know is fish, and it's usually the lake trout," she said. Labranche, who has three children and three grandchildren herself, advises communities in Nunavik that larger fish have higher levels of contaminants, so pregnant women should eat smaller portions, less frequently. They can also choose to eat species such as Arctic char, which is rich in nutrients and low in contaminants. Locally caught fish are tested regularly, and officials are keeping an eye out for consistently high mercury levels in certain types of fish in certain lakes. Results are expected this summer of Canada's largest ever Inuit health survey, which was conducted in 2007 and 2008 and included measurements of blood mercury levels. Public health officials are already considering how they will communicate the results to northern communities. From June 7 to 11, a United Nations Environment Program's intergovernmental negotiating committee will meet in Stockholm to start preparing an agreement to reduce mercury emissions around the world. The negotiations will be based on the work of researchers such as Steffen, Zdanowicz and Stern. In the meantime, Labranche will continue taking her young grandson out on the fishing and hunting trips he looks forward to every weekend. And she'll keep encouraging people in her community to eat country foods. "The nutrients in country foods outweighs the contaminants. It's still the best food that you can eat," she said. "It's part of our culture, it's part of who we are."